These slow cooker liner bags are the best thing since sliced gluten-free bread. They make clean-up a breeze–just toss the bag and wash your crock pot (which won’t have any gross stuck-on food in it). 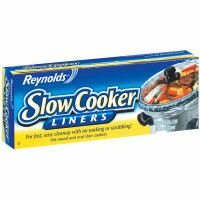 I may need to buy stock in this company with all of the action my Slow Cooker is getting these days! This entry was posted in gluten-free, recipes, slow cooker and tagged crock pot, organization, tip by mollykhodgin. Bookmark the permalink. These look like genius! Are they ok to freeze leftovers in? I haven’t actually tried freezing anything in them. But I bet you could twist the top close (they don’t seal) and put the bag down inside a freezer bag! They are a little flimsy for freezing alone I think!